Last July, the New York Times ran a story about this very topic, aptly titled ‘Bulldozers Meet Historic Chinese Neighborhood’. The neighborhood in question is Gulou (meaning ‘drum tower’, which is the neighborhood’s landmark, along with the adjacent Zhonglou, or ‘bell tower’). Located in central Beijing, just north of the Forbidden City, Gulou is one of the last remaining areas comprising hutongs (narrow alleys) lined by the accompanying siheyuan (traditional courtyard homes). Being one of the few historic neighborhoods left in Beijing, Gulou has become a popular destination for both foreign and domestic tourists. Some spots around the Gulou area, such as Houhai (a tranquil lake surrounded by low-key bars) and Nanluoguxiang (a restored alley cutting through hutong neighborhoods), have been gentrified. That is, trendy boutiques and restaurants featuring international cuisine have popped up in the area, but this has not been at the expense of neighborhood character. With development and prosperity, as well as a foreign influx to Beijing, it was inevitable that gentrification of the neighborhood would take place. Walking around Gulou today is a pleasant experience of old and new. 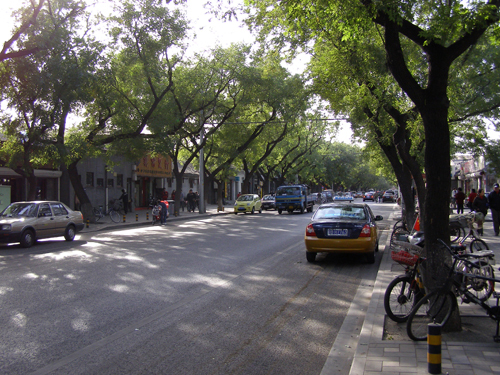 The success of the natural evolution of the hutong to present time has led many locals and foreign expatriates to take up the cause of further preserving the area. As the NY Times article mentions, this process is threatened by a redevelopment scheme that seeks to raze and rebuild large parts of the Gulou neighborhood. Thanks to efforts by preservation groups, these plans have been put on hold, at least for now. Redevelopment in the central area of Beijing is appealing to the local government because it means more opportunity to create tourist retail space that will generate huge revenue for the city. Not only that, but many long-time hutong residents are more than happy to take the huge paydays to relocate out of the center to the peripheral areas of the city. Thus, preservation is left to those who care about preserving the organic atmosphere of the area. Though well-intentioned, the fact that expatriates have taken up the preservation cause means that the effort risks looking like a group of self-righteous foreigners imposing their own quaint and antiquated vision of China on local development, adding another complicated dimension to the already sensitive issue.